RT @SteveReedAP : The Panthers entered the game having outscored opponents 55-7 in the first half in the postseason. They trail 3-0 early. Field at Jeans turf has been slippery. Chris Harris Jr slipped and Emmanuel Sanders wasn't messing around on that punt. 3 and out for @Panthers forces a punt. 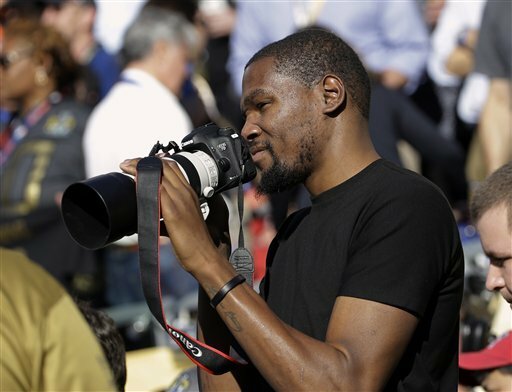 RT @SteveReedAP : Kayvon Webster with a textbook open field tackle on Ted Ginn Jr. Great punt, great coverage. Panthers start at 15. I'm blaming Mike Carey!!!! ???????????????????????????????????????????????????????????????????????????????????????????????????????????????????????????????? RT @TeresaMWalker : So Mike Carey just said on TV that should be overruled as a catch. Then the play stands. What is a catch these days? What a turn of events. Wow. Crowd goes wild! Go #Broncos score! RT @SteveReedAP Jonathan Stewart limping off the field. Left leg. 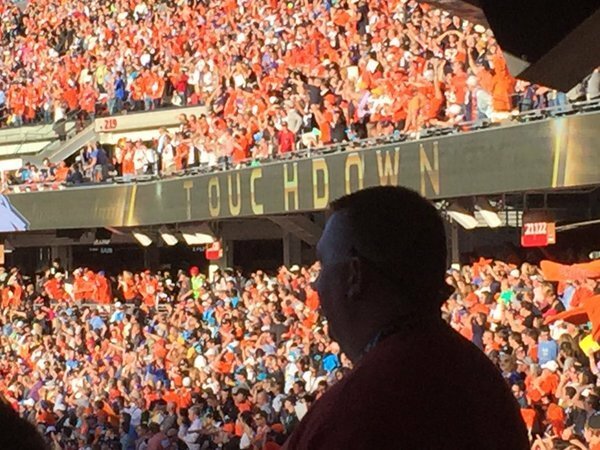 RT @SteveReedAP : Von Miller rips the ball out of Cam Newton's hands and Malik Jackson recovers in the end zone. 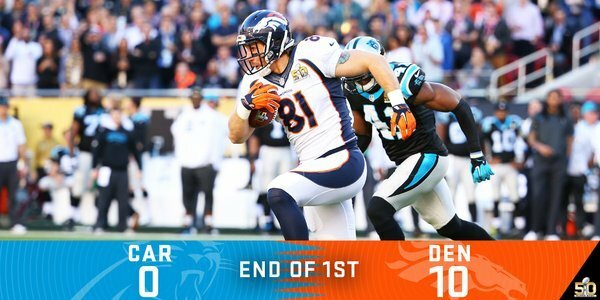 Denver 10, Carolina 0. TOUCHDOWN BRONCOS! 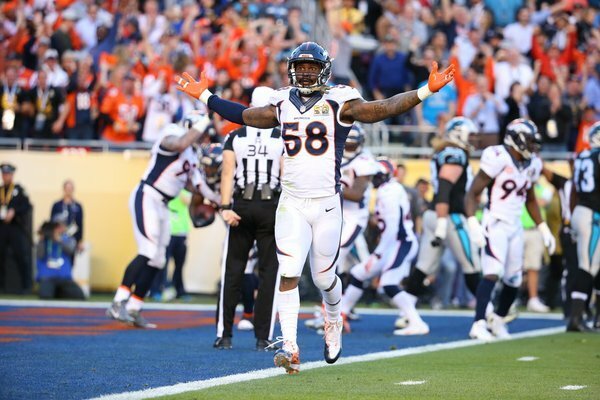 Von Miller w/ strip-sack, recovered by Malik Jackson in the end zone. Von Miller strip sacks Cam Newton. 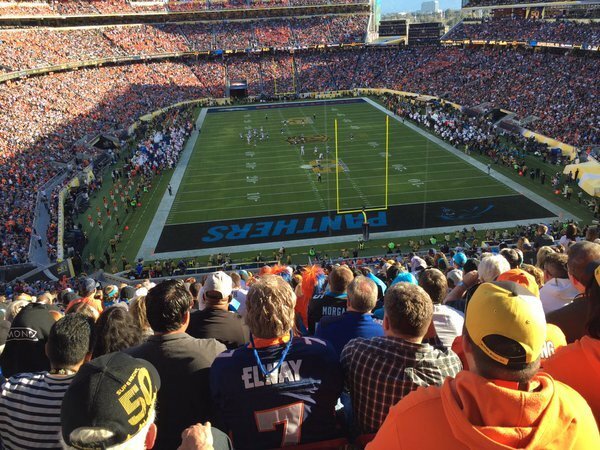 Another #Broncos sack on Cam Newton and the Denver fans are FIRED UP. Just like we all expected...the first taunting penalty is called on the Broncos. RB Jonathan Stewart is questionable with a foot injury.